Life Excellence Insights: Why do some people reach top position fast? Why do some people reach top position fast? Given the right educational background and potential, some people reach the top position in their career very faster than average pace and others it takes a time or stagnant at some level. What makes some people move fast to reach a top position like CEO or head of the organization? 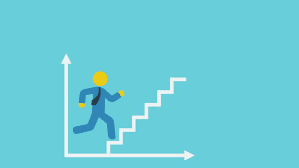 1.Sometimes in their career journey, they step down and take a small role to develop them to accelerate. For example, functional head of large organization takes as in charge of small unit or projects to build his business skill. Even though it looks like step-down, they are preparing themselves for higher responsibilities. 2. Even at young age, they accept significant responsibilities even though they were not ready for that. That is taking a calculated risk and developing self on competency. 3.Emerge out as a visible leader during the crisis.That is, guidance and direction are usually essential during crisis time, and some people emerge as leaders during the crisis. For example, when the specific supplier is shut down the plant, quickly getting into alternate and resuming operations without any damage. The point is, the above behaviors are some of the traits of people who reach the top position at a fast rate. If you have the aspiration for growth, just reflect your mindset, behaviors and your approach! Each one deserves for higher growth in the career!